Have you ever asked yourself "What is buying on margin"? What are the pros and cons? Buying on margin is something that most day traders enjoy because it gives them the opportunity to supercharge their returns. Margin does differ from market to market, most notably in the amount of margin available. In this article, we will take a look at margin, what it is, what it does, and how it affects your day trading performance and day trading strategies like the gap and go strategy. Margin is both beneficial and detrimental, depending on how you use it. It’s one of the most important aspects that traders must be aware of. 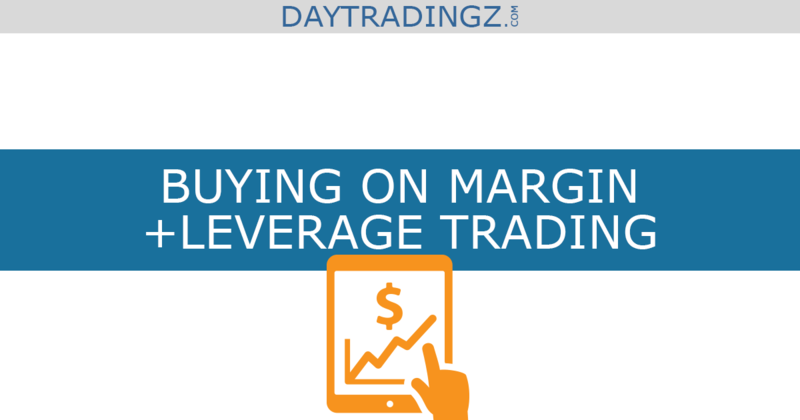 ​What is buying on margin and leverage trading? ​Why is leverage trading useful? Leverage is the ability to multiply your trading capital. For example, you may be looking to trade currencies, and one of the big benefits of trading the Forex markets is that they offer leverage. Leverage gives you the ability to trade a much larger position than you actually have the money to cover. Margin is the amount of money you must put up to trade that larger position. ​Leverage is normally measured and quoted in a format like “1:4”, “1:20”, or some similar figures. What these numbers mean is that for every one dollar you have in your account, you can control the second amount in dollars. ​So if you have “1:4 leverage”, this means that for every dollar in your account you can control four dollars’ worth of stock as an example. So when you look at these ratios, the “1” represents the margin amount used to cover a position worth the second number. This is quite common in the financial markets, as it gives the trader and ability to maximize their gains. However, if you are trading “1:4 leverage”, this also means that your losses move four times faster as well. Leverage is not something to be toyed with but used appropriately can boost your gains. Leverage is useful because it allows smaller accounts to grow rapidly. More importantly, if you are a day trader, you almost have to use leverage, because you need to maximize your trading prospects. However, as mentioned in the article day trading for beginners, leverage can be dangerous if used in the wrong way. Think of it this way: you are looking to buy APPL at $200, but only expect a move to $201.50. If you don’t use leverage, you need to come up with $2000 to control one lot, or 100 shares of Apple. On the move from $200 to $201.50, you would make $150. However, if you were to use leverage at 1:4, you would need to come up with $500 to control those same 100 shares, but still make the $150 profit. Obviously, you can see how attractive this is for day traders as it boosts profits while demanding less in the matter of margin. So if you had somewhat limited funds, this gives you the ability to place a larger trade. It also gives you the ability to place more trades at the same time. If you have a $25,000 account, which is what’s needed to trade the US stock markets as a day trader, you can see just how many trades you could have going on at the same time with 1:4 leverage. If you have your brokerage account in the U.S. and trade with less then $25,000 then the pattern day trader​ rule will limit your trading activities. This is even more useful in markets such as Forex, which quite often have leverage anywhere from 1:20 to 1:1000! The standard Forex lot is 100,000 units, and the ability to trade with that type of leverage gives the trader the ability to get involved in one of the most liquid markets in the world and benefit drastically from a much larger position than they would usually be able to put on. Let’s talk about the dangers of leverage now. If you are trading currencies, will use the average US-based account as an example. The EUR/USD pair offers 1:50 leverage in most US-based Forex accounts. Again, remember that for every one dollar you have in your account, you can control $50 worth of currency. You decide to buy the EUR/USD pair at 1.2000 as it looks ready to rise. You put up $2000 with the margin, and you now control $100,000 worth of currency. At this point, the market starts to go against you. You end up losing 50 pips. With a full lot in the currency markets, each pip represents $10 worth of movement. This is an example of how leverage can work against you. You are now down $500, meaning that you lost 25% of the margin you put up for the trade. If you were to trade with no leverage, you would have had to put up the entire amount of money, which is much more than the margin. The other side of that equation is that losing $500 would be almost nothing from a percentage perspective. Unfortunately, most retail traders don’t understand just how dangerous leverage can be, and they end up blowing up their accounts rather quickly. In fact, it’s recently been reported that the average lifespan of a currency account is 90 days. This is mainly due to the massive amounts of leveraged offered, as the profit and loss statements swing wildly back and forth. This is why on social trading sites you will see people at the top of the trader board that are up 1500% in the last 10 days, but when you look again in three weeks, they aren’t even listed anymore. They have blown up because they have traded so recklessly. Stephanie decides she wants to buy the British pound at 1.31 against the US dollar. She has a Forex account with a total equity of $11,000. Given that amount of equity on hand, in theory she could trade $550,000 worth of currency. That would be $55 per pip. This would be an extraordinarily dangerous thing to do, and quite frankly would not take long at all to get stopped out due to not having enough margin. She could in theory perhaps cut that in half, and decide to buy $250,000 with currency, meaning trade at $25 per pip. She now has $6,000 left in her account to cover any margin, and as the trade goes against her, we will start to see the broker use that extra money to cover her position. So as she loses 2 pips, $50 then is taken from the $6,000, to cover that position. You can see how this might be a problem if the trade goes against her by something like 75 pips, which of course is very possible. If she were to cut her losses at this point, she gets her original margin back, but now loses the $1,875, or 17% of her account. Let’s run the scenario using much more reasonable numbers. She again decides to buy the British pound at 1.31 against the US dollar. Remember that she has $11,000 in total equity and could trade as much as $550,000 worth of currency. However, she recognizes that losses will come and go, and decides to buy $10,000 with the currency, making it $1 per pip. With this size of a trade, she only needs to put up $200 as margin. The trade goes against her just as it did previously, but she never has to dip into a significant amount of her account, and in this scenario loses just $75 or 0.68% of her account. You can see how different the damage can be. While I could have gone on about how much money she could have made, the reality is that there will be losers occasionally. You cannot let those losers wipe out huge chunks of your account. Compounding interest is your best friend, and it’s something that’s built up over time. That’s not to say you can’t use leverage, but you should use it wisely. In conclusion, leverage is very useful if you are cautious about it. There are a lot of brokerages out there that will offer huge amounts of leverage, attracting new traders. You have to be careful when day trading penny stocks because penny stocks are extremely volatile and you can run into trouble when you trade with too high leverages. The reality is that professional traders very rarely use more than 1:10 leverage, let alone something like 1:400 like you see at Forex shops globally. Most of the time this is to get you to trade large and blow up your account so that they can collect the money as many of those brokerages are on the other side of the trade. Even at 1:4, and you should be careful and not trying to go in with your entire account on a particular position. In high frequency trading it is standard to trade on margin​ while retail traders should be careful at any time and most importantly stick to the rules. Why? Because the trading world is littered with the bodies of people who went “all in” on a particular trade, only to see it go against them as they were highly levered. One bad trade that is overly levered can wipe out dozens of other trades if you are not cautious. Professionals use it wisely, and so should you.